Blockchain and its applications are popular nowadays as never before. Ethereum in particular, offering smart contract capabilities, opens the doors to new ideas that can be implemented in a distributed, immutable, and trustless fashion. Getting started in the Ethereum smart contract space can be a little overwhelming as the learning curve is quite steep. We hope that this article (and future articles in the Ethereum series) can alleviate this pain and get you up and running quickly. In this article, we assume you have some basic understanding of blockchain applications and Ethereum. If you feel like you need to brush up your knowledge, we recommend this Ethereum overview from the Truffle framework. There are many different applications of Ethereum smart contracts. The most popular at the moment are cryptocurrencies (implemented as ERC20 tokens) and crowdfunding token sales (a.k.a. initial coin offerings, or ICOs.) A good example of a utility ERC20 token is the Motoro Coin. In this blog post, we will explore something different: The idea of locking funds in crypto wallet contracts. This idea itself has various use cases. There are several examples, but probably the most common reason at the moment to lock funds is called “vesting.” Imagine that you have just raised a successful ICO and your company still holds a majority of tokens distributed between your team members. It would be beneficial to all parties involved to ensure that the tokens held by employees cannot be traded straightaway. If there are no controls in place, any given employee might take action by selling all their tokens, cashing out, and quitting the company. This would negatively affect the market price and make all remaining contributors to the project unhappy. Another idea is to use a smart contract as a crypto-will. Imagine we would like to store our cryptocurrency savings in a contract which will be accessible by members of the family, but only after something has happened to us. Let’s say we should “check in” with the wallet, by evoking some contract call every so-often. If we don’t check in on time, something presumably happened to us and they can withdraw the funds. The proportion of funds they would each receive could either be explicitly set in the contract, or it could be left to be decided by consensus among the family members. The use case we’ll explore for the rest of this blog post is similar: To put some crypto-money away for later for someone else, like a future birthday gift. Let’s imagine we would like to gift one ether to someone for their 18th birthday. We could write down on a piece of paper the account’s private key and the address of the wallet holding the funds and hand it over to them in an envelope. The only thing they would have to do is call a function on the contract from their account once they are 18 and all the funds will be transferred to them. Or, instead, we could just use a simple ÐApp. Sounds good? Let’s get started! TimeLockedWalletFactory.sol is the factory contract which lets anyone easily deploy their own TimeLockedWallet. ToptalToken.sol is a customized ERC20 token. SafeMath.sol is a small library used by ToptalToken for performing safe arithmetic operations. For any questions on writing Ethereum contracts, please refer to the official Solidity smart contract docs. The above line indicates the minimum version of the Solidity compiler required for this contract. Here, we import other contract definitions, used later in the code. The above is our main object. contract scopes the code of our contract. The code described below is from inside the curly brackets. In simple terms, modifier is a precondition that has to be met before even starting the execution of the function it is attached to. This is our first function. As the name is exactly the same as our contract name, it is the constructor and gets called only once when the contract is created. Note that if you were to change the name of the contract, this would become a normal function callable by anyone and form a backdoor in your contract like was the case in the Parity Multisig Wallet bug. Additionally, note that the case matters too, so if this function name were in lowercase it would also become a regular function—again, not something you want here. The above function is of a special type and is called the fallback function. If someone sends any ETH to this contract, we will happily receive it. The contract’s ETH balance will increase and it will trigger a Received event. To enable any other functions to accept incoming ETH, you can mark them with the payable keyword. This is our first regular function. It has no function parameters and defines the output tuple to be returned. Note that this.balance returns the current ether balance of this contract. The above function can only be executed if onlyOwner modifier defined earlier is satisfied. If the require statement is not true, the contract exits with an error. That’s where we check if the unlockDate has gone by. msg.sender is the caller of this function and it gets transferred the entire ether balance of the contract. In the last line, we also fire a Withdrew event. Events are described a bit later. As a consequence, now shouldn’t be used for measuring small time units. Here is our function for withdrawing ERC20 tokens. As the contract itself is unaware of any tokens assigned to this address, we must pass in the address of the deployed ERC20 token we want to withdraw. We instantiate it with ERC20(_tokenContract) and then find and transfer the entire token balance to the recipient. We also fire a WithdrewTokens event. In this snippet, we are defining several events. Triggered events are basically log entries attached to the transaction receipts on the blockchain. Each transaction can attach zero or more log entries. The main uses of events are debugging and monitoring. That’s all we need to time-lock ether and ERC20 tokens—just a few lines of code. Not too bad, huh? Now let’s have a look at our other contract, TimeLockedWalletFactory.sol. There are two main reasons behind creating a higher-level factory contract. The first one is a security concern. By separating the funds in different wallets, we won’t end up with just one contract with a massive amount of ether and tokens. This will give 100% of control to just the wallet owner and hopefully discourage the hackers from trying to exploit it. Secondly, a factory contract allows easy and effortless TimeLockedWallet contract creation, without the requirement of having any development setup present. All you need to do is to call a function from another wallet or ĐApp. The above is straightforward and very similar to the previous contract. Here, we define a mapping type, which is like a dictionary or a map, but with all the possible keys preset and pointing to default values. In the case of the address type, the default is a zero address 0x00. We also have an array type, address, which is holding addresses. In the Solidity language, Arrays always contain one type and can have a fixed or variable length. In our case, the array is unbounded. To sum up our business logic here, we define a mapping called wallets which consists of user addresses—contract creators and owners alike—each pointing to an array of associated wallet contract addresses. Here, we are using the above function to return all contract wallets a _user created or has rights to. Note that view (in older complier versions called constant) denotes that this is a function that doesn’t change the blockchain state and can be therefore called for free, without spending any gas. We gave it a name, a symbol, total supply of one million, and made it divisible up to six decimals. To discover different variations of token contracts, feel free to explore the OpenZeppelin repo. We first import our two contract artifacts TimeLockedWalletFactory and ToptalToken. Then we simply deploy them. We missed TimeLockedWallet on purpose, as this contract is deployed dynamically. For more information on migrations, please refer to the Truffle migrations documentation. You can tell that TimeLockedWalletFactory and ToptalToken got deployed successfully. In order to run this ÐApp, you will need to have an Ethereum-enabled browser. The easiest way of achieving this is to install the MetaMask Chrome plugin. There’s also a visual guide on installing and configuring MetaMask with Truffle. Coming back to our scenario, why don’t we introduce the actors first? Let’s assume Alice is going to be the creator of the time-locked wallet and Bob will be the recipient/eventual owner of the funds. If you want to interact with the described contracts, you don’t have to run them locally: We’ve deployed them to the Ethereum Rinkeby testnet. ToptalToken is deployed here and TimeLockedWalletFactory is deployed here. You can use our deployed ÐApp, linked to the above contracts served by GitHub pages. Note that you need MetaMask installed and connected to Rinkeby. We have come across a couple of issues while developing this project. The first one was the flakiness of MetaMask in Chrome (like complaining about invalid nonce). The easiest fix we found was to just to reinstall the plugin. Also, Truffle would get out of sync sometimes when editing smart contracts and complain with an invalid number of solidity parameters error. We found that a simple rm -r build and doing a compile/migrate again would clear it. We hope that this article has piqued your interest and that you will embark on your developer journey into the land of Ethereum. The path to cyber glory will be steep and time-consuming, but there are many resources out there to help you (like this one which helped us a fair bit). Feel free to get in touch via the comments below. If you would like to know how to use a uPort mobile app instead of MetaMask, have a look at the demo and source code of an alternative, hackathon-winning version of this project. A big thanks goes to Maciek Zielinski for his contributions to this project. The Ethereum Virtual Machine (EVM) is a sandboxed runtime environment for smart contracts implemented as a stack machine that executes bytecode. It focuses on providing security and executing untrusted code by computers all over the world. 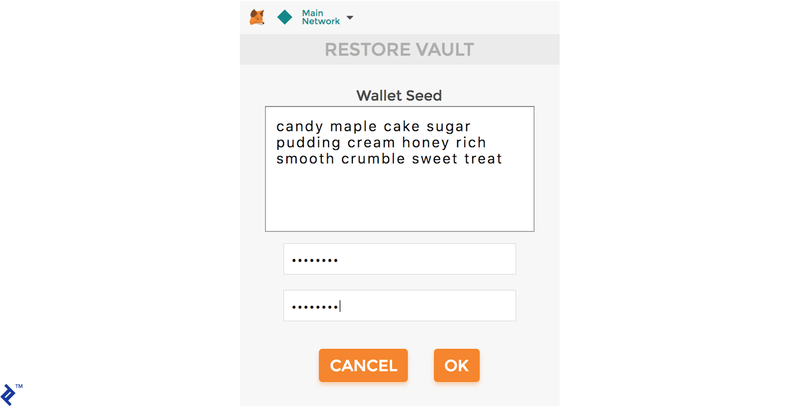 What are Mist and the Ethereum Wallet? Mist is the official browser for distributed applications (ĐApps, sometimes dapps) which are user-friendly front-ends/UIs to the Ethereum network. Ethereum Wallet is one of these ĐApps. Both are developed by the same people that have built Ethereum. Yes, it is fully decentralized in nature. Reading and writing operations are completely decentralized and currently secured by a proof-of-work mechanism. Ethereum is designed in such a way that no single person or group controls the blockchain. Tokens are smart contracts implementing the ERC20 standard. They include operations like getting the total supply and balance and methods for transferring the tokens around. The tokens never really leave the contract, but are simply reassigned to a different holder’s wallet address in an internal mapping.